Written by independent analyst Michael R. Levy from GZ Consulting, this in-depth guide covers everything you need to know if you are considering purchasing sales intelligence software. The sales intelligence industry is growing in complexity and diversity. Virtually all of the vendors have built connectors with CRMs and Marketing Automation platforms. Some vendors are also beginning to develop predictive analytics tools for assisting with lead scoring, while others are investing in mobile apps to assist field sales. In short, there is a great deal of dynamism in the space as sales intelligence vendors are evolving into sales and marketing intelligence solutions. 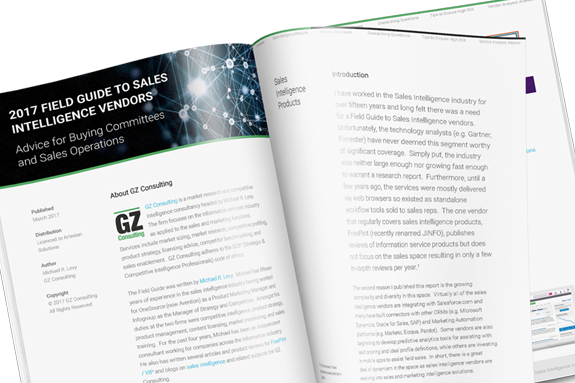 This guide is intended to help buying committees, sales operations and sales leaders in researching, comparing and determining the right sales intelligence vendor for your company.